Bargains can be found for marijuana shoppers. These websites deliver discounts and deals for cannabis coupon clippers. NEW YORK (TheStreet) --Marijuana can cost as much as $500 an ounce, but the bargain hunting cannabis consumer can find a deal if they search. Once upon time, a pothead could buy a "dime" bag, which got the name because an ounce was $10. Of course this was back in the seventies and the price has gone up considerably since those days and a dime bag now refers to ten dollars of product. Marijuana is no longer a back alley deal in some states like Colorado - it's gone main stream. The prices are publicized and the market is transparent. This transparency has created good old fashioned competition for smokers' dollars and with that comes coupons. Who doesn't love a discount? These websites offer deals that even a dealer couldn't offer and borrow heavily from successful retail sites like Groupon (GRPN and Yelp (YELP. 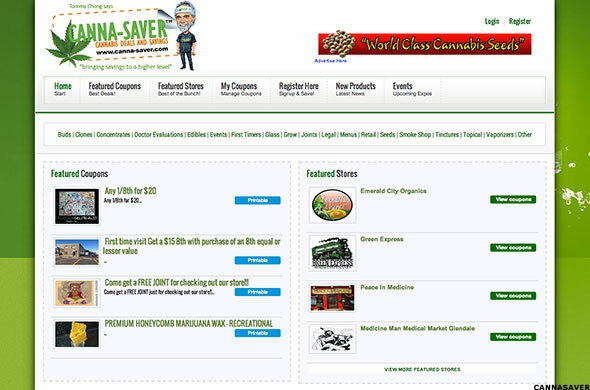 Canna-saver is all about the deals and saving. Coupons are featured right on the home page with featured coupons on one side and then deals by store on the other. One coupon offers a free joint just for checking out the store. Starbucks doesn't even offer that. Some deals have an expiration time, so customers will want to check back for the latest. This site gets the seal of approval from classic cannabis comic Tommy Chong of Cheech & Chong fame. If his cartoon image doesn't sway you, then you aren't a real smoker. Sticky Guide is a cannabis rating and review site. It can be used in California, Colorado and Washington. 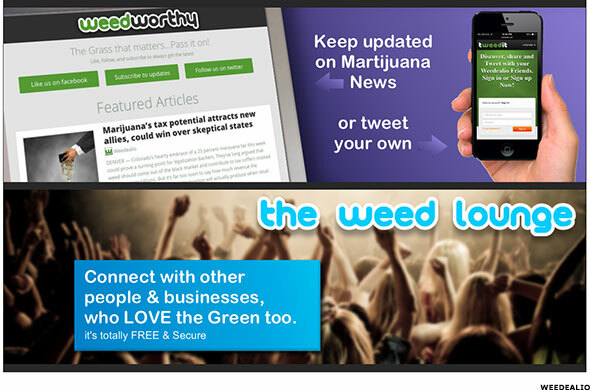 The site lists various dispensaries and rates different strains of marijuana. It also features a coupon menu by zip code and neighborhood. The deals range from a free gift to new members to discounts on the first order. The deals are targeted to new customers with the hopes that they will stick to that location. There were even Valentine's specials on edible candies. A new patient could probably shop around and get first timer discounts at the various dispensaries until they finally decide on their favorite location. This discount marijuana site plays on the Groupon model with the top banner saying Growpon, but the address is cannabis coupon codes. 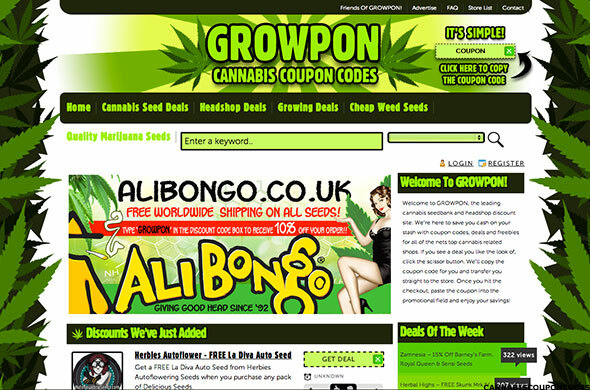 It claims to be the leading seedbank and headshop discount site. They want to save customers cash on their stash. This site does have a seed specialty that the others don't seem to have. There are deals on drying cabinets, grow lights and various hydroponic accessories. They also separate the cheap seeds (13 euro for five seeds) to the premium like White Widow that goes for 47 euro for five seeds. The site also shows which deals are the most viewed. Wikileaf is the cleanest of the sites as far as page layout is concerned. 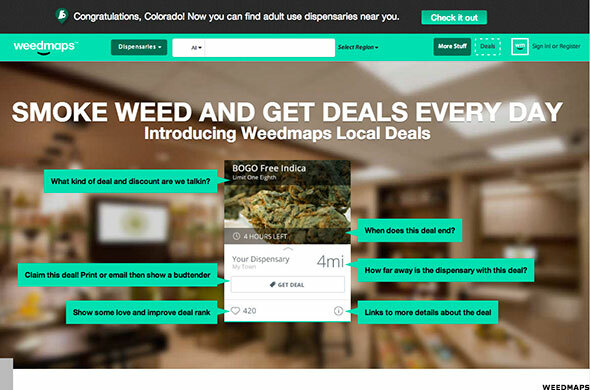 The customer gives the location they are interested in and a map pops up with the stores highlighted with a pot leaf. The customer says how much they want to spend and how far they will travel to see the offers. For example, if you choose Seattle and want to spend $120, a list of stores is displayed with one store willing to sell 28 grams for that price, while another is only offering 17 grams. It doesn't say what strain you get for the price. It is geared towards the medicinal patient and gives a nice review of the strains. You can definitely shop prices, but it isn't a traditional coupon approach. 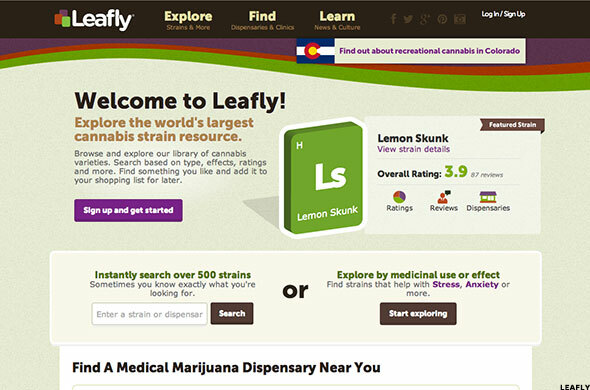 Leafly has a similar strain review page, but it also rates the dispensaries and reviews them. This is where you can filter the cost. You can find dispensaries that average 1/8th of an ounce under $30 or stores that average over $45 for the same quantity. This feature is defined as affordability. Leafly also notes which dispensaries have an ATM machine and which take credit cards, even though the credit card companies have said they won't work with marijuana companies. Customers can also do a search for specials within the dispensary column. Here you'll find daily deals, blowout sales and even happy hour notices. Weedealio has the coupons and deal button right next to the website name, meaning discounts are the main focus. The deals of the week are well presented visually and easy to navigate. The discounts have a time sensitive nature like Groupon deals and a social media component that notes how many people have gotten the coupon. This site also features a marketplace for classified ads where bargain hunters can shop for seeds and hydroponic equipment among other things. This site also provides a dispensary directory with reviews and ratings. Weedmaps has a deal button, but when clicked on the site asks for the customer to select a region and then the top deals will be emailed. This isn't as transparent as the other sites, but is more targeted to the customer's location. 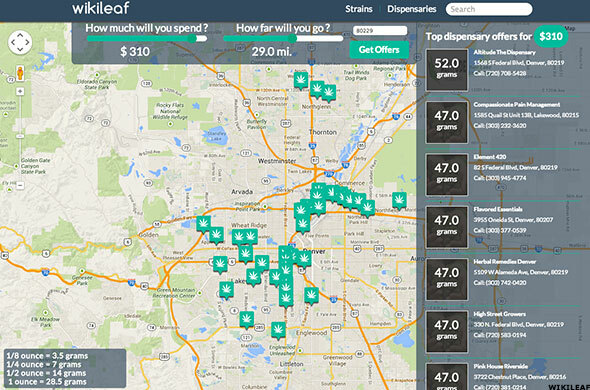 As the name states, this site focuses on mapping the dispensary and then rates it according to customer review. It's been compared to Yelp because of the review function. Each dispensary page lists specials and prices. So if using Weedmaps, the idea would be to settle on a location first and then compare prices.